Chartered Institute of Logistics and Transport (CILT) Sri Lanka recently awarded fellow membership (FCILT) status to experienced transport professional Upali Gunawardena. Since receiving territorial status in 2012, CILT Sri Lanka received rights to award membership locally and Gunawardena is the second chartered member to be awarded fellow membership. He joined CILT in 1996 and became a chartered member in 2006. He has served as a member of the Institute since 1996. He has been instrumental in giving leadership to CILT on countless occasions. He was the project chairman in organising the transport exhibition for CILT with the support of key stakeholders from both the public and private sectors. He has 33 years of experience in all sectors of land transport and automobile engineering. He possesses a proven track record for exceptional success in managing truck fleets and engineering projects. Gunawardena has been appointed twice as the president of the Association of Container Transporters (ACT) in Sri Lanka in 2010/2011 and 2015/2016. In addition, he has been a member of the Institute of Automotive Engineers in Sri Lanka and the International Forum for Rural Transport and Development (IFRTD). By representing the trucking sector, his contribution to the development of the logistics and transport industry thorough his active involvement with ACT is of significance. He played a vital role in getting national recognition for the billion rupee trucking sector and driven by a sense of national interest, adopting best practices to uplift both the standards and service deliverables as well as protecting the sector’s workforce. As a result, numerous awards and recognitions were accorded to him over the years and are a testament to his commitment. Gunawardena has won many awards at both national and provincial levels. His accolades include the National Gold Award 2007, Achiever Industrial Excellence CNCI, Sri Lanka Entrepreneur Bronze Award 2003 FCCISL, Sri Lanka Entrepreneur Merit Award National 2003 FCCISL, Sri Lanka Entrepreneur Merit Award National 2004 FCCISL and Sri Lanka Entrepreneur Merit Award Provincial 2004 FCCISL. 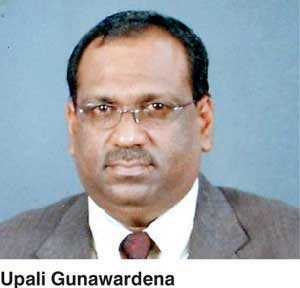 Presently he is the Chairman of Upali Transworks Services. CILT is the leading international professional body for everyone who works within supply chain, logistics and transport. The Institute holds unparalleled international recognition and works towards achieving its objectives promoting, encouraging and coordinating the study of the science and art of logistics and transport through its membership, educational qualifications and events. CILT provides a professional identity to those in the ever-expanding logistics and transport industry. It is a strong, active and unified professional body that is able to speak with authority on strategic issues affecting the logistics and transport industry.